On this site you will find photos and news about our work; global and local. Click on the tab to access the photos, blog, or news sections of our site. Since January 1, 2006 we have worked to fuse two ministries by joining the staff of Central Baptist Church Victoria and working internationally through FEBI. 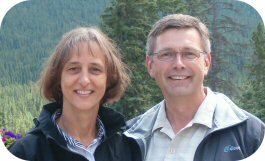 On January 1, 2009 Dave became the full time senior Pastor at Central and serves now on a voluntary basis in Membercare with FEBInternational. Check out Central’s website at www.centralbaptistchurch.ca, and FEBInternational’s site at FEBInternational.ca. Community is established through relationship. People in relationship in the same location is not predictive of the strength of that relationship, however there are significant issues to resolve when people in relationship are separated by distance. Central is a regional Church, its facility is in the core of Victoria but its ‘family’ come from all over region. There is a parallel to FEBInternational which works in 20 different countries outside of Canada. The Mission, like Central, strives to develop a sense of belonging for all of its people. For each, a sense of family; community; and connection; are key to their work and development. Our goal in any location is to facilitate spiritual health in the family so that…God is glorified by making more and better devoted followers of Jesus Christ. We look forward to hearing from those who visit our site.